Public Preparations for the festival begins months ahead. They are usually funded by local residents, businesses and community organizations. The idol making in Maharashtra usually begins with "Padya pooja" or worshipping the feet of Lord Ganesh. The idols are brought to "pandals" or temporary structures usually 15–20 days before. The pandals have elaborate decoration and lighting. At home the festival begins with the purchase and then the ceremonial installation of a clay murti (idol). Families decorate a small, clean portion of the house with flowers and other colourful items before installing the idol. When the idol is installed, it and its shrine are decorated with flowers and other materials. The food offerings to Ganesha include 21 modaka (shown), a type of wrapped dessert. This is also the prasada to the community. In preparation for the festival, artisans create clay models of Ganesha for sale. The idols range in size from 3⁄4 inch (1.9 cm) for homes to over 70 ft (21 m) for large community celebrations. The date for the festival is usually decided by the presence of Chaturthi Thithi. The festival is held during "Bhadrapada Madyahanaa Purvabaddha". If the chaturthi thiti begins at night on previous day and gets over by morning on next day then the next day is observed as vinayaka chaturthi. In the consecration ceremony, a priest performs a Prana Pratishtha to invite Ganesha like a guest. This is followed by the 16-step Shodashopachara ritual, (Sanskrit: Shodash, 16; Upachara, process) during which coconut, jaggery, modaks, durva grass and red hibiscus flowers are offered to the idol. Depending on the region of India,during the ceremony, hymns from the Rigveda, the Ganapati Atharvashirsa, the Upanishads, and the Ganesha stotra (prayer) from the Narada Purana are chanted. In Maharashtra, Aartis are performed with friends and family, typically in the morning and evening. In India, Ganesha Chaturthi is primarily celebrated at home and in public by local community groups in the central and western states of Madhya Pradesh, Maharashtra, Gujarat and Goa and the southern states of Karnataka, Kerala, Andhra Pradesh, Telangana, and Tamil Nadu. At homes in Maharashtra, families install small clay statues for worship during the festival. The idol is worshiped in the morning and evening with offerings of flowers, durva(strands of young grass), karanji and modaks (jaggery and coconut flakes wrapped in rice flour dumplings). The worship ends with the singing of an aarti in honour of Ganesha, other gods and saints. In Maharashtra the Marathi aarti "Sukhakarta Dukhaharta", composed by the 17th century saint, Samarth Ramdas is sung. Family traditions differ about when to end the celebration. Domestic celebrations end after 1 1⁄2, 3, 5, 7 or 11 days. At that time the idol is ceremoniously brought to a body of water (such as a lake, river or the sea) for immersion. In Maharashtra, Ganeshotsav also incorporates other festivals, namely Hartalika and the Gauri festival, the former is observed with a fast by women on the day before Ganesh Chaturthi whilst the latter by the installation of idols of Gauris. In Goa, Ganesh Chaturthi is known as Chavath in Konkani and Parab or Parva ("auspicious celebration"); it begins on the third day of the lunar month of Bhadrapada. On this day Parvati and Shiva are worshiped by women, who fast. Instruments such as ghumots, Crash cymbals (ताळ(taal) in Konkani ) and pakhavaj (an Indian barrel-shaped, two-headed drum) are played during the rituals. The harvest festival, Navyachi Pancham, is celebrated the next day; freshly-harvested paddy is brought home from the fields (or temples) and a puja is conducted. Communities who ordinarily eat seafood refrain from doing so during the festival. In Karnataka the Gowri festival precedes Ganesha Chaturthi, and people across the state wish each other well. In Andhra Pradesh, Ganesha idols of clay (Matti Vinayakudu) and turmeric (Siddhi Vinayakudu) are usually worshiped at home with plaster of Paris idols. In Tamil Nadu the festival, also known as Vinayaka Chaturthi or Pillayar Chaturthi, falls on the fourth day after the new moon in the month of Āvaṇi in the Tamil calendar. The idols are usually made of clay or papier-mâché, since plaster of Paris idols have been banned by the state government.. Idols are also made of coconuts and other organic products. They are worshiped for several days in pandals, and immersed in the Bay of Bengal the following Sunday. In Kerala the festival is also known as Lamboodhara Piranalu, which falls in the month of Chingam. In Thiruvananthapuram a procession marches from the Pazhavangadi Ganapathi Temple to Shankumugham Beach, with tall statues of Ganesha made from organic items and milk immersed in the sea. Ganesha Chaturthi is celebrated in the UK by the migrant Hindu population and the large number of Indians living there. The Hindu Culture and Heritage Society, a Southall-based organisation, celebrated Ganesha Chaturthi for the first time in London in 2005 at the Vishwa Hindu Temple; the idol was immersed in the River Thames at Putney Pier. Another celebration, organised by a Gujarati group, has been celebrated in Southend-on-Sea and attracted an estimated 18,000 devotees. Annual celebrations are also held on the River Mersey in Liverpool. 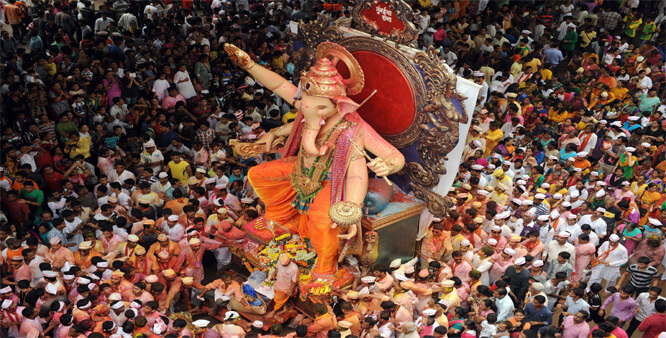 The Philadelphia Ganesha Festival is one of the most popular celebrations of Ganesha Chaturthi in North America, and it is also celebrated in Canada, Mauritius, Malaysia and Singapore. The Mauritius festival dates back to 1896, and the Mauritian government has made it a public holiday. In Malaysia and Singapore, the festival is more commonly known as Vinayagar Chaturthi because of the large Tamil-speaking Hindu minority.